By Abi - Tanzania - 02 Jan/04 - Viewed 1632 times. We arrived in Nairobi on the 21st to pick up a few supplies and camp out for the night before picking up some additional passengers the next day, which was also my birthday. Travis had arranged with the courier to depart from the truck for the afternoon and evening of the 21st for a birthday surprise. I must say I was shocked when I saw our backpacks off the truck as getting into the locked areas is a no-no in the cities. I didn't have a clue what we were doing or where we were going as we said good-bye to the truck and hopped into a cab. We ended up at a very nice hotel with a beautiful pool and gardens. The bell hop took us to our room to show us where everything was and before he left he mentioned that if we would like to have our laundry done, just stick it outside the room. I realized my white shirt was not exactly white anymore--we were filthy! After a relaxing bubble bath, we went to the mall to find a movie, but discovered Lord of the Rings was sold out. Instead we found a bowling place that had some pool tables and we enjoyed the afternoon, bringing pizza back to our room and watching whatever English movies were on TV. It was a treat to not be camping for a night. We met the truck the next morning and were introduced to our other passengers: Simon (marketing expert), Cameron (teacher/vagabond), Don and Kirk (both vets and engaged). Yes, they are all Kiwis, as well! We headed to the Tanzanian border and while waiting for customs were surrounded by the Maasai women selling their beaded jewellry. I have always heard about their different customs, but I had a difficult time looking away from their earlobes hanging down with large holes in them. They were very friendly and we enjoyed watching the Maasai warriors with their brightly colored tunics and spears caring for their cattle as we bumped down the road. That evening we camped at a place called Snake Park, a few hours outside of the Serengeti. We were all very excited to be heading into the Serengeti for the next few days and would spend Christmas Day there as well. After a five hour drive on the morning of the 23rd, we entered the Serengeti and immediately spotted two caracols, which are extremely rare. They are a variety of cat and quite beautiful, but they didn't hang around too long. We also were excited to be able to see a pride of lions, four mamas, with about 12 cubs of different ages all playing under the shade of a large tree. For lunch we had some chicken and were warned by our guides to watch out for kite birds who would swoop down and take the chicken. Everyone was on high alert, but sure enough, one came down so silently and swept a piece of chicken right out from between Jess' fingers and mouth. She wasn't hurt, just surprised! We all quickly finished our lunch casting our eyes up on the lookout. Right about sunset we were fortunate to spot a leopard lounging in a tree. With the sun setting directly behind him, he was very difficult to pinpoint. That night around the campfire, we were told that if we needed to go to the restroom in the middle of the night to take another person with you and that the lions might be prowling quite close to the camp. You can bet I held it until the next morning! Christmas Eve day was very exciting as we witnessed a mama and her cub carrying a fresh kill of wildebeast. A few minutes later, we came upon a pride of nine female lions tearing apart another wildebeast. We had just missed the kill by about half an hour. It was amazing to watch them rip the meat apart. After they were full, they sauntered off to rest under a shade tree. That evening we camped at the rim of the Ngorogoro Crater, a volcano that collapsed. The crater is about 20 kilometers across the bottom and full of wildlife. We enjoyed a delicious zebra stew for dinner. Christmas day was very unusual in that it was hard to remember it was a special day. Several times I completely forgot about it. The only time we have been reminded that it was nearing has been in grocery stores where we have heard a few carols on the radio. We drove down into the Crater and while we didn't see any kills, enjoyed close ups of jackals, cape buffalo, hyenas and even saw a black rhino. 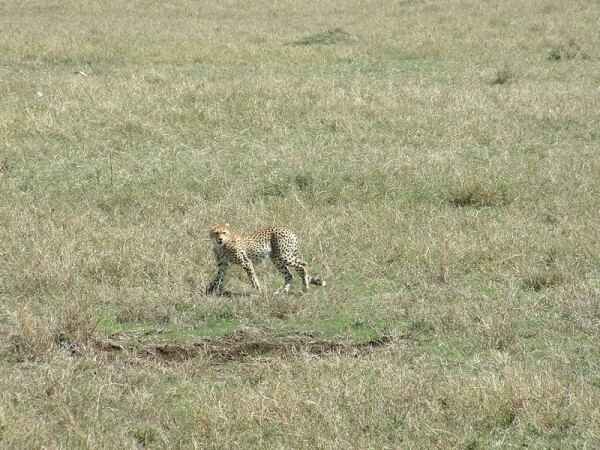 We also saw a mama cheetah with three cubs passing through. Late in the afternoon, we made the drive back to Snake Park where we had a large buffet of wildebeast, pig, and impala (a variety of antelope) waiting for us. It was definitely one for the record books. We spent the next two days making some headway into Dar Es Salaam, Tanzania, where we boarded a ferry for Zanzibar island. We spent the first night in Stone Town and had a very cultured experience for dinner. The locals set up tables with a little grill on the side and display their seafood catches of the day. They sell crab, calamari, squid, octopus, shrimp, fish, etc. and you select what you want. Then they grill it up for you and you eat it with your hands. Very yummy, but I'm not sure about the hygiene. Still, it was a great experience. The next day we drove for about an hour to reach the small village of Kenwa where there was a secluded resort. We spent the next four days here relaxing, swimming in the Indian Ocean, playing sand volleyball, pool, napping, reading, etc., etc. No one was ready to leave when the time came! On New Year's Eve we had a big bonfire on the beach and enjoyed counting down the minutes to 2004. Back in Stone Town on our last day, the second of January, we took a Spice Tour where we were able to view the different spices like vanilla, cardamon, ginger, chili, cinnamon, lemongrass, clovews, tumeric, pepper and nutmeg in their raw form. It was very interesting learning about all the different uses for each of them. Tonight we return to Dar Es Salaam on the overnight ferry.